Gary Smith with his safety award presented by CEAO Executive Director Dean Ringle (left), outgoing CEAO President Paul Gruner (right), and Clinton County Engineer and new CEAO President Jeff Linkous. 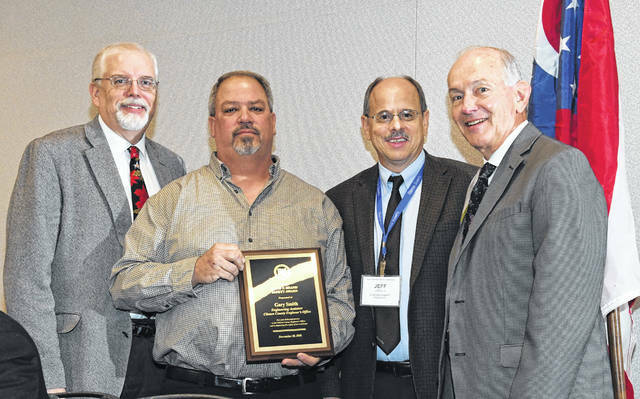 Gary Smith, Engineering Assistant at the Clinton County Engineer’s Office, was awarded the CEAO David Brand Safety Award at the County Commissioners Association of Ohio and County Engineers Association of Ohio Winter Conference in December. Smith was nominated for this award for his commitment and dedication to enhance the safety of the traveling public within our county. Since 1980, he has been involved with many areas including bridge and culvert inspection, right-of-way permits, driveway permits, overload permits, and road inventory. In addition, Smith maintains an accident database and maps accidents that involved county or township roads. He creates a five-year summary of any problem areas which are reviewed with the county engineer to establish solutions for each location.